There were buzzer-beating goals, impossible saves and dueling breakaways as regulation time expired. There were controversial calls, high-impact collisions, blows to the head and impromptu wrestling matches. There was overtime. Of course there was overtime. There was so much high-end entertainment you half expected to hear the rumbling of a Navy flyover or, at the very least, see someone to touch of a Civil War era cannon. Instead, it was A.J. Reid who fired the shot heard round the state in Class 1A, as he slammed home a rebound goal 68 seconds into the extra session to allow No. 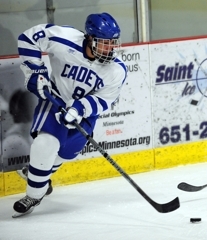 1-ranked St. Thomas Academy to escape with a 6-5 victory over No. 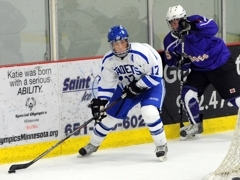 4 Rochester Lourdes on Tuesday, Feb. 8, at the St. Thomas Ice Arena in Mendota Heights. “It was good to get that because I know everybody was running out of gas,” Reid, a senior forward, said about his game winner. 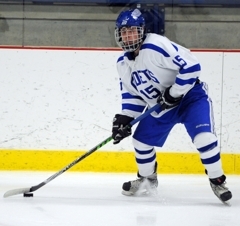 Reid also scored with .5 seconds remaining in the second period to pull St. Thomas Academy (15-5-0) to within 5-4 heading into the third. But if he was giving out the game puck, Reid said he would hand deliver it to Cadets junior goaltender Ian West. It would be hard to argue with Reid about the game’s MVP, given that West all but pulled a rabbit out of his facemask and released doves from his trapper when he dove through the crease and made a save on a Jason Samuelson shot that had “Sure Goal” written all over it with just a few minutes left in regulation. After the game, no one seemed to know exactly how West had deflected the puck into the mesh above the Plexiglass. Upon further video review, it turns out the shaft of West’s goalie stick was all that kept Samuelson’s shot from going into the net and giving Lourdes the upset victory. It was that kind of game. A little whacky, a lot unpredictable. 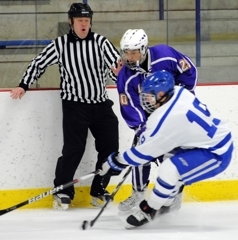 In the final minute of regulation, St Thomas Academy’s Andrew Commers sprung loose for a breakway chance. 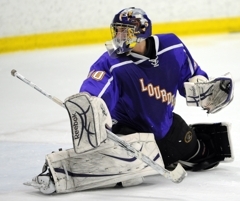 Lourdes goaltender Nick Heimer made the save, and right back the other way came the Eagles. Speedster Landon Farrell roared past the Cadets’ defense and fired a shot that clanged off the left goalpost. It wasn’t a bad night for the Eagles’ confidence either. Lourdes (19-3-0) has one of the state’s best records, but when it comes to respect the Eagles have been a middle-of-the-road team. A schedule that is considered mediocre has a lot to do with that, although the performance against the Cadets should change a lot of opinions about the Eagles. There was something for everyone in this game, it seems. Reid gets the game puck, but forwards it to West. The Eagles get a healthy heaping of respect. The fans get a smorgasbord of action. Hard to go home hungry after that game. Even without that military flyover. A.J. 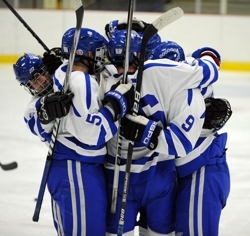 Reid scored 68 seconds into overtime to lift St. Thomas Academy, ranked No. 1 in Class 1A, past No. 4-ranked Rochester Lourdes 6-5 on Tuesday, Feb. 8, at St. Thomas Ice Arena in a suspense-filled game filled with YouTube worthy theatrics. 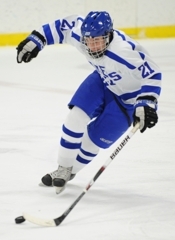 St. Thomas Academy forced the overtime period when Peter Krieger scored the only goal of the third, ripping a wrist shot past Eagles’ goaltender Nick Heimer’s catching glove with 6:05 left in regulation. The Cadets (15-5-0) took a 1-0 lead 6:59 into the opening period but never led again until Reid’s rebound goal ended a remarkably high-scoring, offense-heavy matchup between teams known more for their stingy defense. Rochester Lourdes (19-3-0) scored three unanswered goals to end the first period with a 3-1 lead. The Eagles led 5-4 after a wild second period that included five goals, all of them scored on special teams. 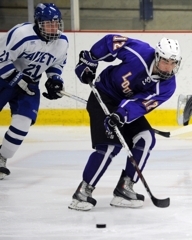 Jason Samuelson and Landon Farrell each scored twice for Rochester Lourdes. Brian Wasz also added a goal for the Eagles. 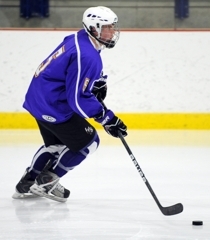 Zach Schroeder and Reid each had two goals to lead the Cadets. Reid scored a rebound goal with .5 seconds left in the second period. 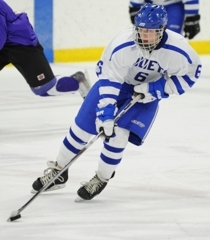 Taylor Fleming also scored for St. Thomas Academy. The teams traded breakaway chances in the final minute of overtime, with the Cadets’ Andrew Commers missing his chance just seconds before Lourdes’ Landon Farrell raced in alone and rang a shot off the left goalpost. Perhaps the most dramatic moment in a game filled with them was supplied by St. Thomas Academy junior goaltender Ian West in the closing minutes of the third. A replacement for starter David Zevnik late in the second period, West looked to have no chance to save a shot by Jason Saumeulson, who took a pass through the crease from Alex Funk and had what appeared to be a wide open net to shoot at. Video replays showed the puck deflecting off the shaft of West's stick and over the net as the goaltender flung himself through the crease. West stopped all seven shots he faced in relief of Zevnik, who stopped six of 11 shots. Heimer stopped 27 of 33 shots for the Eagles. 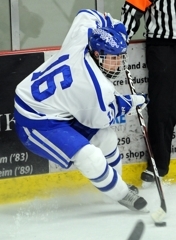 The hard-charging senior scored two clutch goals, the first coming with .5 seconds left in the second period. He one-upped himself for sheer drama by scoring again 1:08 into overtime. Both goals came off rebounds sitting just outside the crease, an area wehre Reid spends a lot of time. The junior forward scored twice and flashed his nitro-fueled wheels all game, repeatedly scooting around the Cadets’ defense. West gets the star here strictly on the merits of one of the most unlikely a hockey fan will ever witness, robbing the Eagles’ Jason Samuelson of what appeared to be a sure goal late in regulation. While luck might have played a role in West’s save – the puck deflected off the shaft of his stick as he flew across he crease – he still gets high marks for style and timeliness.